For most people, social media is just that: social. It's a way to stay connected with friends, family, and business associates. Facebook, especially, allows you to share your thoughts, your photos, and your humblebrags, and it allows you to present the perfect version of your life. You can show how funny you are, how up on current events you are, and you can even show off all the cool things you do. But there are those who use social media and Facebook for shadier purposes, such as scamming for money, cyberstalking their ex, and using it as a way to cheat on their partners. It used to be much easier to flirt by the message feature; however, Facebook made it so that if you message someone not on your friend list, your message doesn't go to the recipient's regular message box. Instead, it goes to an another section of the received messages where it can be easily overlooked. But there is good news for cheaters and shameless flirters. According to an article on Elite Daily, Facebook is working (allegedly) on a new feature that will allow you to post comments under people's posts without anyone else seeing it. It's like Tinder with cleverness. You can flirt and be completely inappropriate without your boyfriend or girlfriend having any idea that you're trying to get with someone else. Let's also not forget how damaging to a relationship emotional cheating can be, and this new feature will really facilitate that kind of emotional betrayal. 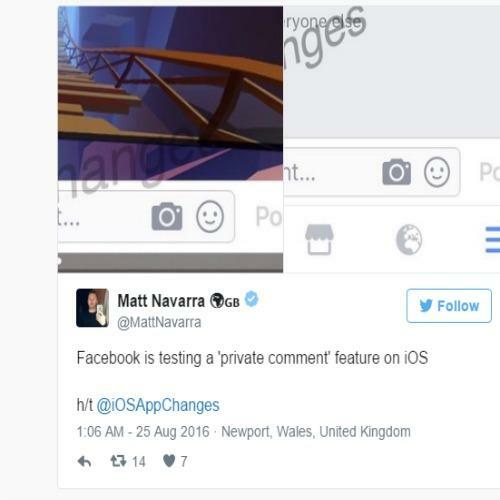 Matt Navarra shared a screenshot of how it would work and posted it on Twitter. Your sexually charged comment won't be seen by the public. You'll be able to make your comment a private comment, and the phrase "this comment is hidden from everyone else" will appear with a fun padlock symbol. You'll be able to flirt with someone right under your partner's nose without them being aware of it. You're not flirting or trying to hook up with someone outside your relationship — you're just working on your social media platform, and emotional cheating isn't really bad. Cheaters are always going to cheat, it's just how they're made. But Facebook is working on making it a little easier for them.